Simply enter that promo code under the price on the sales page. It's a 30% discount which is pretty significant. For those that would like to take a look at the HUD display for the Forex Thor EA system brainyforex has set up a page showing it here. I got interested in this system primarily because of the maths behind it. Alexander Collins the developer said it was based upon a take profit of 30 to 42 pips with a stop loss of 6 to 8 pips and enters trades based upon supply and demand (Market depth). So far our testing shows 5 trades, all being winners. Of course there will be losing trades, and I look forward to seeing the size of these. That's what is really important. Anyhow, so far this system looks very good. or take a look inside the system here. Further to my last email about the Market Depth automated trading system called Forex Thor, it has now launched and is available with a rock solid 90 day PLIMUS refund guarantee. The developer of the EA Alexander Collins is very confident of his technology behind the system. It has broker protection, 1:3 risk reward ratio, 30 to 42 pips profit target with 6 to 8 stop loss along with safe guards for correct installation. He even offers an extra $100 cash if the robot does not produce a profit within the three month refund period. It's in current test mode with us. So be sure to check out its trading statistics on our site here. It's been setup through an Australian broker called SynergyFX. The ECN demo account has been used. SynergyFX say that this account is exactly the same as a real account. Remember this robot EA is different from other robots in that it trades by "Market Depth". It checks out to see when there is an overbalance between buyers and sellers and places orders accordingly. Just remember also that this robot does not trade every day. Looking at it's live results presented on the home page you will notice that it can even go without trading for close to a couple of weeks by the look of it. Check out the dates for yourself. If you decide to grab a copy, we look forward to hearing your feedback on it. Brainyforex review page is here. Stay tuned for next update. Forex Thor EA uses no technical analysis but market depth We have added a new type of automated trading system to our list of forex robots being tested. It's called Forex Thor and buys and sells currencies based upon market depth. A totally different concept to other EA robots that use technical analysis and indicators. Forex Thor uses no indicators, just an algorithmic maths based model of 1:3 risk reward ratio based upon supply and demand through market depth data. 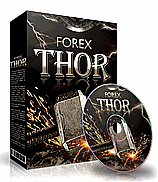 Forex Thor launches on the 15th December 2011, 9am EST and is expected to be very popular. It's been developed by Alexander Collins. Take a look at this interesting robot and informative video's here. You can also check out our trading statistics for the system as we have just placed it on test the other day here. If you decide to grab a copy, we look forward to hearing your feedback on it. A review page for Forex Thor has been created here.